In a move that delighted millions of vice presidential candidate Leni Robredo's supporters, former Justice secretary Leila de Lima has joined as overall consultant of her legal team. 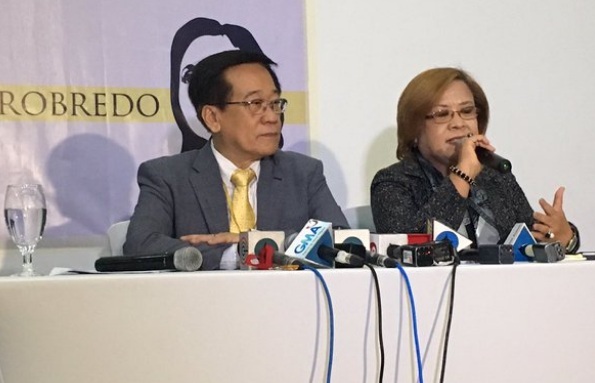 Attorney Romulo Macalintal, who heads Robredo's legal team , said that de Lima volunteered for the job and called him up regarding the matter. Macalintal said he was "very glad" that de Lima called. Macalintal made the announcement during a press conference on Monday. De Lima and Macalintal, expect a heated battle with the legal team of Sen. Ferdinand "Bongbong" Marcos Jr., who will be facing them at the National Board of Canvassers. The legal team of Marcos is composed of George Garcia and Francesca Huang. Marcos has accused Robredo's camp of cheating in the elections. He pointed out that the introduction of a dubious script in the Smartmatic code, allowed Robredo to overtake him in the unofficial counts. As soon as the news broke out that de Lima got on board Robredo's legal team, it became a hot topic on social media. The surname "De Lima" was on Twitter's list of trending topics for several hours. Reactions were mixed as expected, since Marcos and Robredo have almost the same number of supporters. The National Board of Canvassers (NBOC), composed of members of the Senate and the House of Representatives, will start the official canvassing of votes for the president and vice president at 2 P.M. on May 25. Winners for the top 2 positions of the land will have to be proclaimed on June 8 since the 16th Congress will end its last regular session on June 10.